Excellent description of our SMALL town of Auxvasse. Current and past residents can purchase a T-shirt from one other business on Main Street (old Hwy.54). I have one a friend ordered afterBI gave a tour of every street in Auxvasse that took about 10 minutes due to describing many of the things Tom wrote about. T-shirt reads. "I'm from AUXVASSE (OF-OZ) It's not that hard!" There is a TShirt shop, Brenda's hairstylist, and a doctor's office still in the original "downtown area." other business are scattered at different ends of the town. Kelli, something else about a small town is that everyone knows damn near everything about everyone else. You are too young to remember but your grandparents lived in a brick house to the left of ours (we moved to a different house in 1959 when I was 7) that my mom had purchased, renovated and sold to them. It had been owned by an old maid named Miss Lou – I barely remember Miss Lou and can't remember her last name but my brother and sister would. I used go over to sit with them on their front porch. I remember your grandma Florence’s husky voice and how your grandpa always wore a straw hat. Your brother Eddie is two years older than I, your brother Jesse is (I believe) two years younger and you were quite a bit younger. I recall how excited your grandparents were when you were born. A girl! I remember your dad, of course, and your red-headed mother Alice from “Ba Ha Ba.” (Did she ever lose that Down East accent she had in her early years in Missouri? I hope not.) My mom always told a great story about your grandma. One day one of her nephews or great-nephews, Ralph Pickerell, was getting married. Mom asked Florence if she was going to the wedding. She said, “No, weddings always end in tears.” Not exactly an upbeat statement but a true one. Glad you enjoyed the column! Miss Lou was Lou Henderson, I remember, as she was distant kin to me. Presbyterian Church didn't burn down, just damaged, as it sits there today much like in the 1940s when I attended Sunday School in it. It has new annex and basement, and now only one front door, whereas then there were two, one for the men and one for the women, I was told, but by the '40 it did not seem to matter. Of course -- Henderson! Miss Lou always wore a sun bonnet. Do you remember Alice Scott, the only African-American member of the Presbyterian Church? I'm going to write a post about her one of these days. She lived next door to us and was a huge presence in our family. Don't remember your cousins, but I've heard of them ... and I certainly remember your parents. Thanks for reading and to taking the time to comment! Tom, thanks for Miss Alice's name! I could not remember it. Yes! She sat in the rear, on the preacher's right side, same seat always. Seemed strange to me at the time, but that was before I attended any intergrated church or other group! How times changed during our lives. Do post on her as I know little else. Enjoyed reading other posts and replies. Tom, have you written about Miss Alice? If so, I need to go out and find. If Barb, my sister,and/or I walked by we always stopped to visit if she was on her porch. 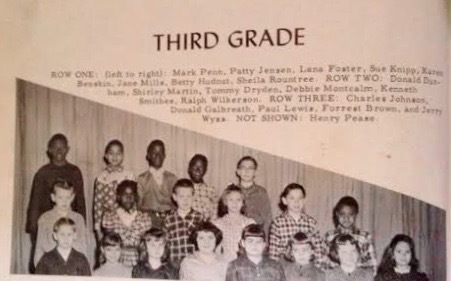 Same with Mrs. Neff and Mrs. Palmer,(always stated in reverse order of this) who Mom called Parmer and I didn't know wasn't correct until your Mom, Ruby, gave me an antique bowl for my college graduation and she had tape on the bottom saying she had bought at sale when they closed out their house. Kids today miss out on so much because only walk if have to and then have a device looking at and don't visit. Small towns aren't even the same. Oh, the booming metropolis Auxvasse population now about 1,000 as grew to South and East and annexed Burt addition and other areas to West and Norrh.